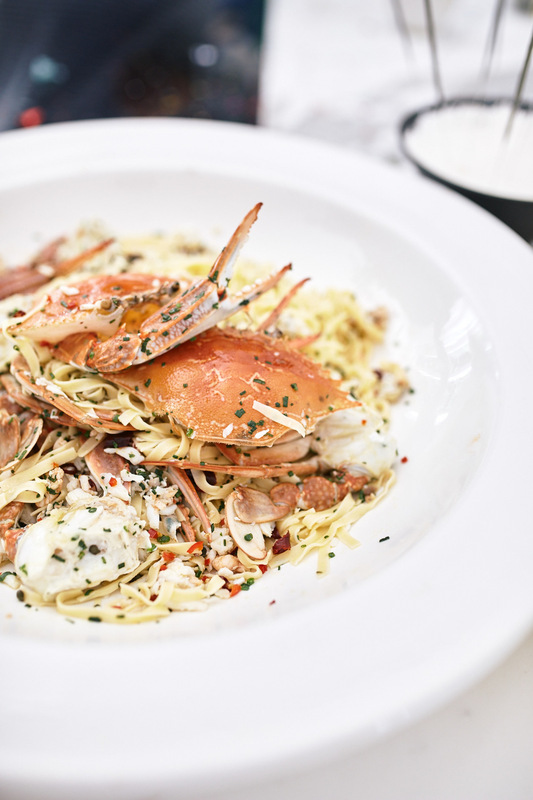 This Blue Swimmer Crab Tagliolini is a wonderful dish to share with friends for dinner. An easy dish to prepare and cook. To make the pasta Combine all the above ingredients to form a ball, wrap in Clingfilm and allow to rest for one hour. Roll out pasta on pasta machine done to 1.5, then push the sheets through the Tagliolini cutter. Dust with semolina and set aside until ready to cook. In a sautÃ© pan add half the oil and gently fry garlic, chillies and anchovy, add capers and crab meat and cook for approx. 5 -7min, then remove from the heat. Add cut pasta to boiling water (the fresh pasta will not take long to cook). When pasta has floated to the top add the precooked crabs and allow to boil. Once pasta is cooked strain off keeping some of the water. Bring the heat back to the sautÃ© pan add the cooked pasta, crabs, remainder off the oil. If dry you can add some of the pasta water. Finish with the chopped chive and the juice of lemon.